This swim with the dolphins facility, is renown for its great swims with dolphins, snorkeling with dolphins and everglade tours. Each of these are great life experiences that can never be truly replicated. 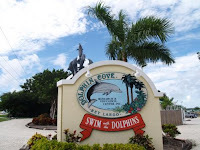 And each experience is unique in its own right, the dolphin swim is where you get to touch and pet the soft smooth skin of the dolphin followed by an exhilarating ride across the bay water. Next they have the sea lion encounter, the cute cuddly sea lion jumps out to meet you and is thrilled to have your attention for the day. Next up of course is the everglade tour, where you can experience and live through the marine ecosystems that inhibit the everglades. This is one experience you cant miss and is guaranteed to leave a smile ion your face. The actual swim with dolphins in Key Largo, what a majestic and whimsical idea, to be carried away from your troubles and fears, to a place and land where only peace and tranquility may inhibit your mind, and possess your soul, the swim with dolphins in Key Largo seems to make that a reality with its great open lagoon setting and plenty of open space for the dolphin to feel comfortable, its always a guaranteed good time. First you get the 30 minute lecture on the do's and dont's on proper protocol to handle and treat the dolphin with respect. After that, you get to actually get in the water with the dolphins, first they do some warm up tricks, to have the dolphin get to know each of the participants better. And once that has taken place, your ready for the dolphin swim, pure adrenalin rush, you have not truly moved till a dolphin has pulled you through water. It is a memory that will live in the hearts of those who experience it.